"Originally known as a defender, as a centre-forward he excels. There is no doubt that he will mould into the best in Ireland." Representative Honours: Ireland: 1 Full Cap (1901). In the early 1900s the "gentlemen" Freebooters were amongst the dominant Dublin teams, supplying four internationals (for a total of ten caps). They were formed in 1898 and played until 1905/06. Their only competitive matches took place in the Irish Cup. Their history peaked with an appearance in the 1901 Irish Cup Final against Cliftonville. In all they played 14 cup matches, winning 7, drawing 2 and losing 7 with a goal tally of 46-36. Apart from the appearance in the Final they reached the fifth round on three other occasions. Their most regular opponent was Linfield who they beat 2-1 in the semi-final in their Cup Final year and also managed a 3-3 draw and two defeats. 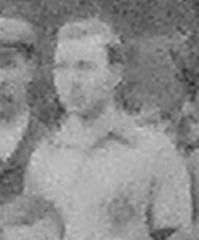 John Mansfield came into the team for the Cup match against Bohemians in October 1899, a 2-1 defeat. His next Cup match was against Dundalk in October 1900 and Freebooters ran out 10-0 winners with John scoring 5. He scored 2 in the 3-1 defeat of Richmond Rovers in January 1901 and made his International debut early in March and assisted in defeating Linfield in the semi-final the following week. He missed the Final as he was called up for Army duties. A 2nd Lieutenant in the Royal Engineers, it was reported in the 18th October 1901 newspapers that he would be going to India in the early part of the year. An International debutant at 19 years 159 days, a promising career thus came to an abrupt end. He rose to the rank of Lieutenant Colonel with the Royal Engineers. During the Second World War he came out of retirement, requesting to serve at the lower rank of Major. * Probable details, courtesy of Cris Freddi.